This cardio workout is held in shallow water for all fitness levels and can be for non-swimmers. Noodles or hand held weights may be used. Lisa has been a long time fitness instructor at MAC. She has her group exercise certification through the YMCA. She also has certifications through Silver Sneakers and Arthritis Foundation. She currently teaches water aerobics and Silver Sneakers where she enjoys motivating her participants through music to make the exercise class a fun and beneficial experience! 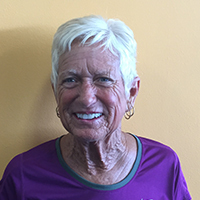 Carolyn Mahaney has been an aerobics instructor since 2003 and teaches water aerobics and SilverSneakers classes at MAC. She taught school at Milford for 27 years and has a permanent teaching certificate for grades 1-8 and a Master's in Elementary Education from Xavier University. Carolyn currently holds the following certifications – CPR and AED, Aquatic Exercise Association, Arthritis Foundation, Hydro Pilates, Hydro Rider, and White Crow Aqua Pilates. She is also trained in SilverSneakers Classic, Cardio Fit, Yoga, and Splash. She loves to share her passion for fitness with the wonderful members at MAC. "Whether you just want to improve your general health or whether you are facing a major obstacle, water can make a difference. It was a game changer for me. 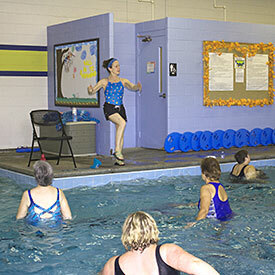 Come visit and sit on the pool benches, watch a water class, meet the “Pool Posse” or join in and make a splash."